Gathering Storm is both a companion game to A World at War and a game in its own right, with its own victory conditions. 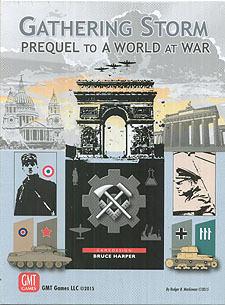 Starting in 1935, Germany, Italy, Britain, France, and Russia prepare for the war that is bound to come - but which war? Britain or France against Italy in support of Ethiopia? An early war with Germany over the Rhineland, or Austria? A German attack on Russia? A pre-emptive attack on Germany by the Allies? Or maybe even something like the historical war - but with enough differences to change the outcome? Gathering Storm lets the player explore an even wider range of options than does A World at War. What might have happened if: Admiral Doenitz had convinced his superiors of the importance of submarine warfare in the impending war with Britain; Germany had pursued the Z Plan earlier and more consistently; the development of the Ural bomber had been pursued; Mussolini had given a lower priority to naval armaments, to the benefit of the Italian armour and air forces; Italy had attacked Yugoslavia or Greece; France had extended the Maginot Line; de Gaulle's arguments to expand and strengthen France's armour units had been accepted; Britain had rearmed sooner; Russia had deferred the Great Purges, or accelerated them; the Spanish Civil War had been won by the Loyalists - or not broken out at all, with a civil war in Yugoslavia, or Greece instead? What if YOU had been in command? While the major powers strive to improve their military, economic, political, diplomatic, and research situations for the coming war, and try to ensure that that war is the war they want to fight, they must contend, not only with their opponents, but with random events which can create opportunities and shatter hopes - sometimes both at once. Just as Gathering Storm ensures that no two A World at War games are ever alike, even at the start, the random events ensure that every Gathering Storm game is different. With a playing time of 3-4 nerve-wracking hours, Gathering Storm's elegant mechanics eliminate die rolls and almost all paperwork, but its structure is consistent with A World at War and allows for a seamless transition to whatever alternate war the players planned - or stumbled into. Some 30 years in development, with more than three years of design and playtesting, Gathering Storm is the culmination of the A World at War game system and provides endless replay value.